King of K&A: Plain Sights at Wishart St. & Kensington Ave. The Flomar Building, now home to Esperanza Health Center and the Hispanic Community and Counseling Services, in K&A (Kensington and Allegheny), serves as an example of a would-be eyesore that went from neighborhood burden to neighborhood benefit. The building was built in 1928 for the Northeastern Title and Trust Company. While other banks in the area were building low-slung Neoclassical stone castles, Northeastern opted for a brick high-rise. While it was an ostentatious megalith that represented the company’s success, the Wall Street Crash of 1929 led to Northeastern merging with the Industrial Trust Company of Philadelphia, and taking on its name in 1930. 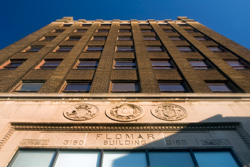 In the 1950s, the Flomar Corporation bought the building and etched its name above the entrance, a legacy still seen at the 3160 Kensington Avenue building today. In the early 1970s, the Commonwealth of Pennsylvania leased the building and it spent the next two decades as the Community Legal Partners Northeast Law Center. By 1998, the building’s dilapidated condition forced every last office tenant out. Years later, Impact Services was given $1 million from the Commonwealth of Pennsylvania’s 2003 budget to rehabilitate the building. The local nonprofit commissioned architects to create a modern office with retail space on the ground floor. The building reopened in late 2007 and houses the Esperanza Health Center, a faith-based bilingual health care service, and the Hispanic Community and Counseling Services, a nonprofit that provides mental health support.